I finally got my mirrors working. It's been an extremely long project that I've worked on sporadically since December. I actually bought the mirrors before I'd even bought the Accord I have now. Basically, three things went into the decision I made to get the ALPS Korea switch instead of the the ALPS Japan switch that the JDM CB comes with. One, the switch that I received with the mirrors had the logo rubbed off, so I wanted a replacement anyway. Second, they did not come with a relay so there was another $25 that needed to be spent. And finally, all of my switches in my car have been converted to LED switches and I wanted to find a mirror switch that illuminated. I believe the 1st generation Honda Jazz(Fit) also has the same style switch and comes with a power-folding option. Basically any JDM car from 2001 and on that uses a switch that has a similar form factor to this will be the one you want. They moved to ALPS Korea in 2001. 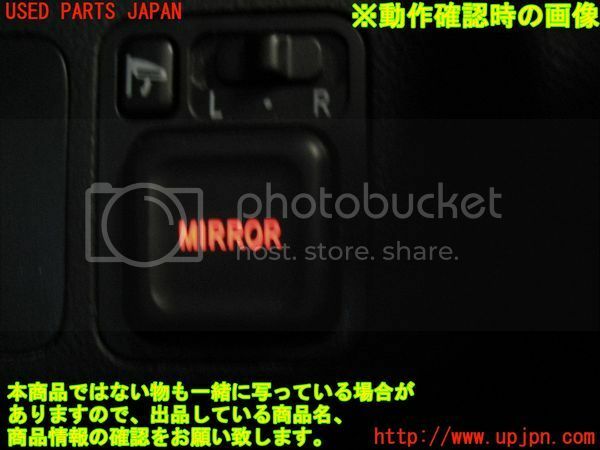 The neat thing about this switch is that you do not need to have an exterior relay in order to control the mirrors. Lucifer1 was a big help for me in sorting this out. Essentially I followed his guide for adapting the regular mirror switch over to the illuminated one found in 2001-2005 Civics and second generation CR-Vs. Then once the mirrors were working perfectly that way I added the wires for the power-folding functionality. It seemed difficult at first with almost no documentation online about the process but I finally just made a test harness and tried it on the car. I got it with the first orientation of wire placement! Without further adieu, this is the harness diagram that resulted. 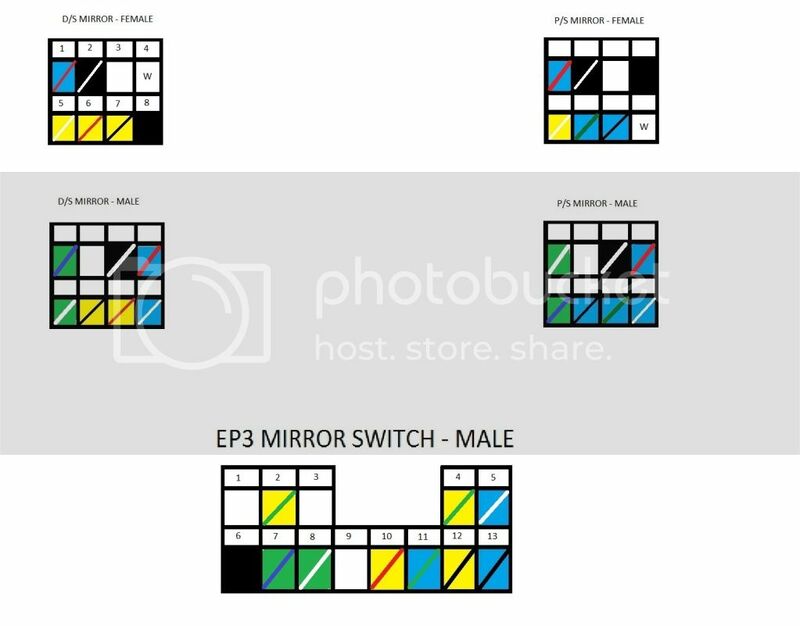 With this diagram you can control your power-folding mirrors with an illuminated switch and no relay at all. All images of the connectors show them as if looking from the back of the connector itself, as it should be. The male and female connectors of each side are mirrored so that the coordinate with each other when plugged in. You'll also see that the connector has two additional wires in it as well. I also added heated lenses to these mirrors while I had them opened up. If you don't care about heated lenses, ignore the blue/red and black/white wires. They don't go to the switch anyway as they run to the under-dash fuse box. I'll get more pictures of my process if needed but for the most part the pictures already provided within the other DIY guides do most of the explaining. I did take tons along the way so if there is a particular picture you need, ask and I'll get it for you. If I don't have it already, I'll go take it. You, my friend, are awesome! Without you responding selflessly to my nagging e-mails this wouldn't have happened. Also, I seem to have forgot that I owe you some pictures. I'll send them later tonight.